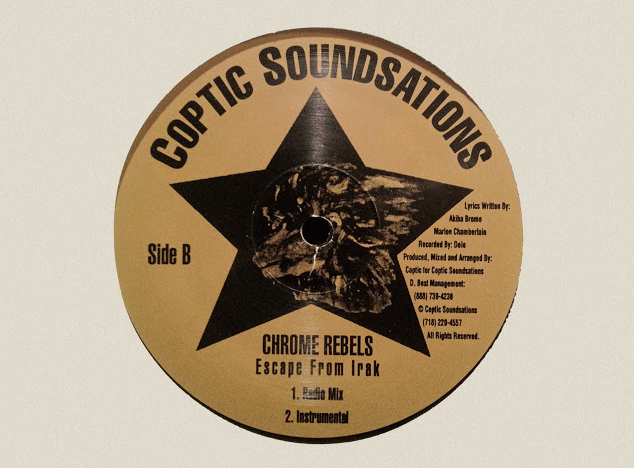 Out of Lefrak City, Queens, this is the 1997 vinyl release from Chrome Rebels, ‘Escape From Irak,’ on Coptic Soundstations. The track was produced by Coptic, who later did production on tracks with G.Depp, Puff, KRS; a record on Biggie’s ‘Born Again’ album, and others. The two eMCees, Mr. Chrome and Treb Rebel, released this single during a Queens heatwave, which saw releases like CNN's 'The War Report' in '97, Mobb Deep's 'Hell on Earth' the year prior, and plenty more from Nas, Nature, Trag, Noyd, etc. That was stiff competition for an independent release, but it had mixtape appeal. It's not impossible to track down a copy of the 12", but it may run you at least $25-30 unless it's at a thrift store, lol. The 12" comes on a generic sleeve with a newspaper-like print on the front. I grew up 10 minutes from Lefrak, so maybe I'm bias to all things Queens, but it's worth diggin' up - don't take my word for it, you can listen to the full 12" below. As always, if you have an update or more info on the artists, leave me a note in the comments, and I'll check it out.